HCS today unveils a moving tribute to the former pupils of the School who have given their lives in conflicts around the World. Seventy ceramic poppies from the Tower of London will, for the first time, mark the sacrifice of OH in WW1. 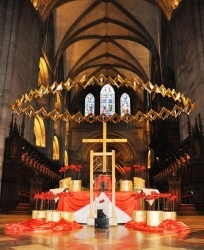 The Poppies displayed in Hereford Cathedral were purchased by the OH Club.